California, Hawaii, Maryland and Oregon are the states that will take the biggest bite out of your earnings after taxes, according to a new analysis. 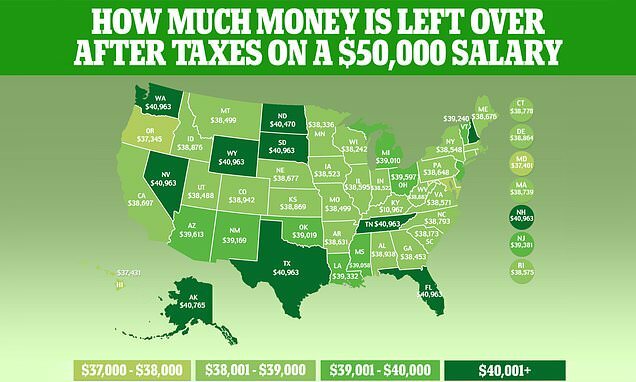 Researchers at GoBankingRates analyzed tax data in each state to determine how much money is left over after taxes for Americans with a $50,000 vs. $200,000 salary. Nationwide, someone with a $50,000 salary takes home an average of $39,129 each year – or $3,261 per month. The national average income after taxes for someone with a $200,000 salary is $136,700, or $11,392 a month. People making $200,000 a year are in the top 10 percent of U.S. earners, while those earning $50,000 are more on par with the average American, given the median U.S. salary of $56,516. Wherever you fall on the spectrum, the reality of take home pay will vary depending on the state in which you live. California has a progressive tax rate ranging from 1 – 13.3 percent depending on how much you earn – making it one of the highest taxed states in the nation. Similarly, Hawaii has a tax rate ranging from 1.4-11 percent, while Oregon’s falls between 5-9.9 percent and Maryland’s ranges from 2-5.75 percent. Ultimately, Oregon has the lowest take home salary in the nation for earners in both categories: a $50,000 salary adds up to $37,345 after taxes, while a $200,000 salary amounts to $127,720 in take home pay.